The National Radio Astronomy Observatory (NRAO), Long Baseline Observatory (LBO), and Green Bank Observatory (GBO) invite submission of brief Expressions of Interest (EoIs) in Principal Investigator-led "eXtra Large Proposals" (X-Proposals) for the Very Large Array (VLA), Very Long Baseline Array, and Green Bank Telescope requiring 1000 hours or more of telescope time, and running over multiple semesters (and possibly multiple VLA configurations). Responses will be used to gauge the level of community interest in such proposals, and their scientific potential. NRAO, GBO, and LBO will seek advice from their advisory committees and the joint Time Allocation Committee on the EoIs submitted. It is important to note that the observatories may not proceed to a Call for X-Proposals if, for example, there is judged to be insufficient community interest, scientific merit, or differentiation from Large Proposals. We are happy to announce the release of the draft ngVLA Science Book. With 50 refereed contributions by ~ 200 unique authors, and 10+ chapters still in preparation, this volume highlights key areas of astrophysics that are ripe for major breakthroughs and underscores the broad U.S. and international support for pursuing a next-generation Very Large Array (ngVLA). The science book contributions will be accepted by our Science Advisory Council until 1 September in the hope that community members will consider authoring additional chapters, especially for areas not in the current draft. Instructions for submitting chapters are online. The deadline for accepting submissions will allow for time for formal publication via the Astronomical Society of the Pacific monograph series, with copies in-hand for the January 2019 American Astronomical Society meeting. This deadline also ensures that the book and individual chapters will be listed in the SAO/NASA Astrophysics Data System for maximum visibility to the Astro 2020 panel members. All first-authors will receive a complimentary copy. While this published volume will serve as a critical snapshot for the ngVLA project status and a vision for the ngVLA transformational science, we envisage the science book as a living document that will be periodically updated until the initiation of construction. 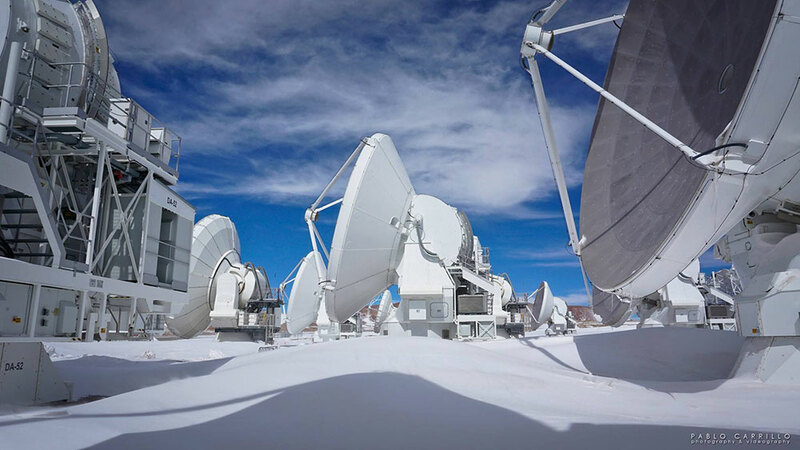 18 July snowstorm at the ALMA Array Operations Site. An exceptional snowstorm on 18 July halted ALMA observations pending clearing of the substantial amounts of snow in drifts encompassing the antennas. The array has transitioned from the most compact configuration to the second most compact C43-2 configuration (2.3 arcsecond beam at 100 GHz, 15m to 314m baselines). Array elements will continue to move outward in an expanding array cycle, continuing the expansion to C43-5 by the 30 September 2018 end of Cycle 5 science observing. Principal Investigators have received notices of the status of their Cycle 6 proposal time requests, following ALMA Proposal Review Panel (APRP) recommendations and accounting for executive share balance and expected time availability. The record 1836 proposals requested 19,690 hours of observing time while only ~4000 hours could be offered on the 12-m Array and 3000 hours on the Atacama Compact Array (ACA) in Cycle 6. The total amount of time awarded to Grade A and Grade B proposals is ~3820 hours; ~20% of all proposals received Grade A or B. The APRP recommended that four Large Programs be scheduled for Cycle 6, collectively assigned 446 hours, the largest time allocation per Cycle to Large Programs that has been awarded to date. The NRAO and the Long Baseline Observatory will conduct a two-day Community Event hosted by the Instituto Nacional de Astrofísica, Óptica y Electrónica (INAOE) in Puebla, Mexico, on 13-14 September 2018. The registration deadline is 30 August. The program is designed for up to 40 participants, and we will accept them in the order their registrations are received. The U.S. National Radio Science Meeting has issued a call for papers (due date 17 September) to be presented at its meeting 9-12 January 2019 in Boulder, Colorado. The International Union of Radio Science (URSI) ­– Commission J is sponsoring a plenary presentation this year that will be given by Sean Dougherty, ALMA Director. The U.S. National Committee – URSI will support the travel of numerous students going to the 2019 National Radio Science Meeting. An ALMA Special Session at the 233rd AAS Meeting 6-10 January 2019 in Seattle will present ALMA news, capabilities, and expectations for ALMA performance and science in the next few cycles. There will be an associated poster session (ALMA or other results welcome). Science talks will be presented by Sean Dougherty (ALMA), Yashar Hezaveh (Kavli), Meredith Macgregor (Carnegie), Arielle Moullet (NASA Ames), Erik Rosolowsky (Alberta) and Brett McGuire (NRAO). The science talks will cover ALMA results ranging from the Solar System to cosmological scales, as well as astrochemistry at ALMA's highest frequencies. Support available to the community from the North American ALMA Science Center (NAASC) at the NRAO will be highlighted. The Arizona Radio Observatory (ARO) solicits observing proposals for the ALMA Prototype 12-meter Telescope (12m) located on Kitt Peak, Arizona, and for the 10-meter Submillimeter Telescope (SMT) located on Mount Graham, Arizona, for the period 15 October 2018 – 15 February 2019. Proposal candidates should submit up to three pages of scientific and technical justification (including figures, tables, and references) in addition to their Proposal Summary Sheet. All proposal candidates are required to list on the Proposal Summary Sheet their requested observing blocks (the exact LST ranges to be scheduled and number of times to be repeated), dates on which they are not available to observe, and dates in which sources in those observing blocks are within the Sun-avoidance zone (45 degrees at the SMT, 10 degrees at the 12m). The 12m ALMA Prototype antenna currently supports an ALMA Band 3 (82.5-116 GHz) dual-polarization SBS (sideband-separating) receiver. The 12m control system supports dual-polarization in the same sideband or single-polarization in each sideband (“2 IF mode”), position-switched, beam-switched, and OTF observations. The new AROWS spectrometer is the recommended backend for 12m observations. The MAC and Filterbanks are available; however, the Filterbanks will be decommissioned at the end of the 2018B semester. Possible backend modes may be found on the ARO Equipment Summary and Status sheet. The 10m SMT currently supports a dual-polarization ALMA Band 6 (211-280 GHz) receiver with SBS mixers. Higher frequency receivers will not be available this semester. The SMT control system supports both dual-polarization (“2 IF mode”) and dual-polarization+dual-sideband observations (“4 IF mode”) with tunable IF from 4.5-7.5 GHz, for position-switched, beam-switched, and OTF observations. Proposal candidates should consult the ARO Equipment Summary and Status sheet for additional technical specifications. Remote observing is available. Observers who plan to observe remotely must supply fixed IP address(es) of the computer(s) that will be used during observing on their Proposal Summary Sheet. For further information about remote observing and other operational questions, please contact Tom Folkers, ARO Software Engineer: tfolkers@email.arizona.edu. Next deadline for proposals is 23:59 MST on 10 September 2018. It is with great regret that I report the passing of our colleague and friend, Bernard (Bernie) F. Burke, on Sunday, 5 August 2018. He was an accomplished scientist who made fundamental contributions to astronomy and was a great friend to many in our community. Burke received his undergraduate physics degree from the Massachusetts Institute of Technology (MIT) in 1950 and his Ph. D. in physics, also from MIT, in 1953. From 1953 – 65 he was a staff member at the Carnegie Institution of Washington, engaged primarily in research in radio astronomy, and became Chair of the Radio Astronomy Section (1962 – 65). Burke joined the MIT faculty as Professor of Physics in 1965 and was most recently was the William A. M. Burden Professor of Astrophysics Emeritus and a principal investigator at the MIT Kavli Institute for Astrophysics and Space Research. Burke's research and influence extended across many fields of astrophysics. His most notable work included discovery of the decametric radio noise from Jupiter in 1955 with collaborator Kenneth Franklin; and the 1988 discovery, as part of a six-person team, of the first Einstein ring. Burke also contributed substantially to the development of very long baseline interferometry from the ground and space, and the study of exo-planets. With colleague F. Graham-Smith, he co-authored the popular text book, An Introduction to Radio Astronomy, now in its third edition. He also supervised numerous students throughout his long tenure at MIT, many of whom went on to distinguished careers. Burke received many honors, including the prestigious Helen B. Warner Prize of the American Astronomical Society (1963) that is awarded annually to a young astronomer for a significant contribution to observational or theoretical astronomy. 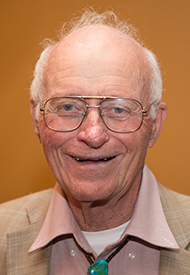 Burke was elected to the National Academy of Sciences in 1970, and he was a popular Jansky Lecturer at the National Radio Astronomy Observatory in 1998. Burke served his community in many roles. He was a Councilor and then President of the American Astronomical Society (1971 – 74, 1986 – 88) and a member of the National Science Foundation Astronomy Advisory Panel (1958 – 63). His service for the National Radio Astronomy Observatory included a term on the NRAO Visiting Committee (1958 – 62) and active participation over nearly two decades as a Trustee for Associated Universities, Inc. (1972 – 90). NRAO and the broader astronomy community owe much to Bernie, and his intellect, style, and wit will be sorely missed. Assistant Scientist or Associate Scientist: The NRAO is recruiting two scientific staff positions to be located in Socorro, New Mexico, the home of the Domenici Science Operations Center that houses the scientific, engineering, technical, computer and support staff for the Karl G. Jansky Very Large Array (VLA) and the Very Long Baseline Array (VLBA). The Science Operations Center also houses the control center and correlator for VLBA observations and hosts personnel working on the Atacama Large Millimeter/submillimeter Array (ALMA). The VLBA is entering a period of financial stability offered by a new partnership arrangement. Over the next several years, new development and user support projects will be launched which will improve the capabilities of the VLBA. The staff scientists recruited for these positions are expected to facilitate cutting-edge science done by community members and work to enhance the observing capabilities for the VLBA. About this month's photo: For years and years, through the 1970s and well into the 1980s, the roof of Charlottesville's Edgemont Road building leaked into the library. Water dripped, trickled, and on some occasions poured in when there were heavy or extended rains, and the assorted containers to catch water were a constant presence. Larger containers regularly housed rubber ducks and wind-up bath toys. University of Virginia Physical Plant staff tried various unsuccessful fixes, including capping the large skylight in the center of the library ceiling. However, the skylight itself had never leaked, and capping it only made the flooding worse, since all the water that once pooled inside the raised rim of the skylight then sluiced off onto the surrounding roof. 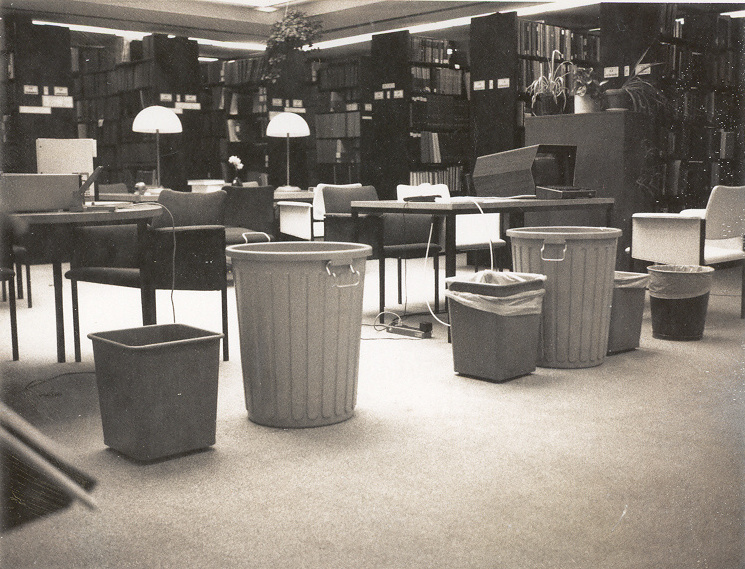 On the Friday night of a rainy Memorial Day weekend in the mid-1980s, one of the computer operators – yes, we still had round-the-clock computer operators then – came up to the library for a journal and discovered two-inch deep (and rising) water on the library floor. He and several others who happened to be in the building emptied overflowing water barrels and, with garden hoses one person brought from his nearby home, improvised a drain to carry water from the second-floor library, down the stairs, and out into the parking lot. Due to their quick action, only 40-50 volumes were damaged. One person went up to the attic to look at the roof and reported that there was so much water under the asphalt roofing that it surface undulated like a waterbed. After that flood, the entire roof over the library was torn off, and the long-time culprit, a massive crack in the sub-roof, was revealed. Once a new sub-roof and roof were installed, the buckets, garbage pails, and rubber ducks were permanently retired. One rubber duck still resides in the NRAO/AUI Archives as a reminder of those years.